If the pH gets too near or above 7.2 in your Portable Farms® Aquaponics System’s Fish Tank, your plants cannot absorb the nutrients in the system and creates a NUTRIENT SHUTDOWN and your plants will begin to wither, show systems of leaf curl, begin to yellow, have stunted growth and not produce growth or blossoms. In effect, the plants are starving to death. The Portable Farms® Aquaponics Systems are designed to accomplish this adjustment in an extremely easy manner. Checking the pH in your system at least a couple of times per week is vital, especially as the vegetables approach harvest time; this is an inexpensive process to increase production in the grow trays. This simple checking and adjustment will result in more bountiful harvests of healthy and nutritious produce. Each plant has a preferred range of pH, or parts Hydrogen, that creates an ideal growing environment for the plant. In aquaponics, this adjustment is very easily when the water flows through the system. To ‘increase’ the pH means to make the solution more alkaline and to ‘decrease’ the pH means to make the solution more acidic. There are quick and very inexpensive ways to change the pH of water in an aquaponics system. 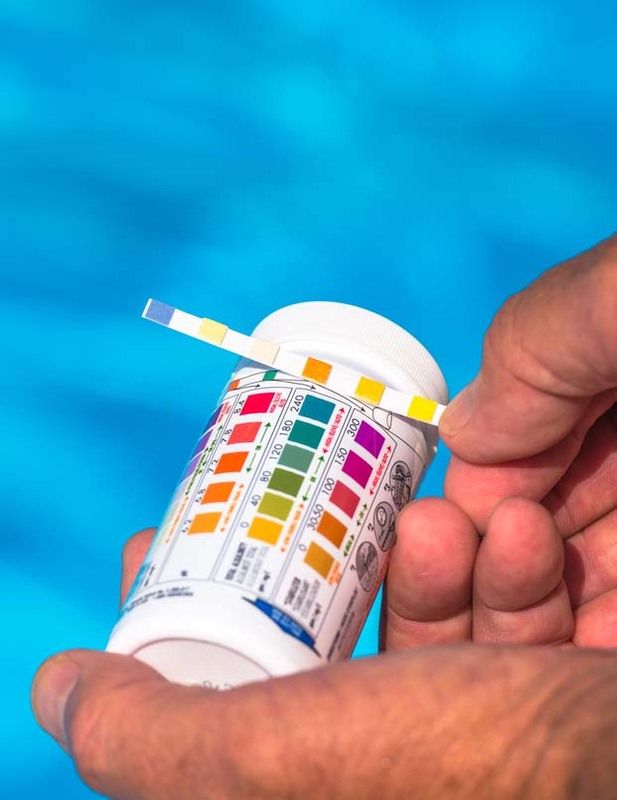 When adding any agent to adjust the pH levels in your system, allow several hours, and better yet, monitor your system over a day or two before trusting the testing medium results. 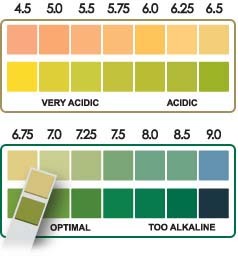 We check the pH in our fish tanks two or more times per month to make sure the pH is below 7.2. Plants in Portable Farms Aquaponics Systems prefer a pH in the 5.8 to 6.8 range, or even a slightly lower range. Fish prefer a little higher pH and to keep both organisms happy, the water in an aquaponics system needs to be adjusted. The measurement of pH is how acidic (6.9 and below) or alkaline (7.1 or above) a liquid is at any specific moment. This pH measurement is not about the water’s hardness, that is a measurement of the dissolved mineral content in the water, and it is measured in a different way. In aquaponics, this adjustment is very easily when the water flows through the system. To ‘increase’ the pH means to make the solution more alkaline and to ‘decrease’ the pH means to make the solution more acidic. There are quick and very inexpensive ways to change the pH of water in an aquaponic’s system. If you are trying to grow vegetables with very different pH requirements in the same grow tray, plant the heavy feeders at the beginning (top) end of the tray and furthest from your fish tank, where the water flows into your grow tray, favoring their pH requirement and the light feeders at the end where the water flows out. We use a Microprocessor Conductivity & TDS Meters with Automatic Temperature Compensation with Automatic Calibration to check the water in our systems (image left). I am just in the information gathering stage. I have 10 acres of land and a 3 acre pre-existing established pond. I live in Louisiana, so freezing is not an issue. I have black bass, crappie, brim or sun perch, catfish, turtles, and probably a beaver or two in the pond. I use the pond now to water my St. Augustine grass and for fishing. The pond is on average, 10 ft.deep. Can I use the pond water for an aqua phonics system, and if so, what testing criteria do I need to adhere to to know if the water is nutrient rich enough to support 3 or 4- 4’x40′ grow beds? The use of ponds for aquaculture works well. The trick is to balance the nutrient load of the water with the needs of the plants. Will it work, yes, how well it works in your situation is going to require some trial and error time on your part. The Portable Farms® Aquaponics Systems are designed to be closed loop with a captive fish population balanced with the size of the Grow Tables. The Aquaponics University Portable Farms Aquaponics Systems Course© very carefully covers the formulas and ratios necessary for successfully operating the systems. In the past we offered consulting for pond aquaponics, but we no longer offer that service because every situation is so different. The PFAS pumping systems we use require one of our CAD Pumps per 200 sq ft of Grow Table space because of the fish tank size limits. The grow area can be greatly expanded, but figuring out how to scale up to the size you are suggesting will involve consulting time. The CAD Pumps are designed to handle at least ten times this size of grow space, but the rest of a pond aquaponics system will require some modifications. You also need to have the Grow Tables INSIDE a climatically adapted structure for control of bugs and the elements. Leaving the Grow Table exposed to the elements means you will have a seasonal system. It could work if you are willing to fail fast and often to get it adjusted. We trust this information is helpful even if it is not exactly what you wanted to hear. In your videos and pictures of your grow trays-you mention a grow tray is used for each plant. One tray for lettuce, another for tomatoes, another for green beans etc..
My understanding is that the water in your system comes from the fish pond-therefore it is using the nutrients in the water (a single water source). How does one balance the PH for each tray(different plant) when the water source is the same? In closing I would like to say I find your systems very fascinating! The Grow Tray Tables can be planted with any plants that you want to eat and as long as you make sure the tall plants are not shading the shorter plants they all will grow fine. We do not use ponds, we use Fish Tanks and there is one Fish Tank per Grow Table. There is never a common sources of fish water except in the case of a single Module installation. Interestingly the pH adjustments are rarely a problem. Once the initial pH is established and the make up water is adjusted for, the pH will remain within a very close range. Each Grow Tray will tend to be incredibly stable in relationship to the pH level. We have gone months without even checking the pH is many of our systems because they very so little. We trust this information helps in some fashion. Do you own an aquaponics system that doesn’t work right? Are you ready for some REAL expert help to give you quick advice to make your system work correctly and produce healthy fish and vegetables? We know. You did everything ‘they’ told you to do. You followed all their instructions and you’re system STILL doesn’t work right. Call today to book 30 minutes of Aquaponics Coaching to get all your questions answered with Colle Davis, the inventor of Portable Farms™ Aquaponics Systems (patent pending). Cost: $100 for 30 minutes of phone coaching. Write up your questions now and call us. Payment by PayPal, Visa, MasterCard or Discover Card. Call to book your appointment: 760-208-2663. EMAIL.